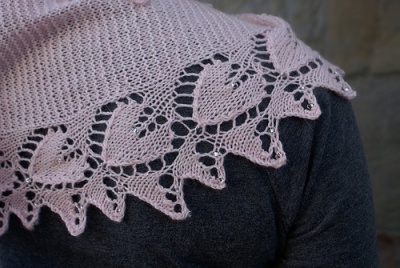 Petal colorway in Lunar yarn from Shibui (each kit will have one skein). This one and the following show other photos of Sivia's original scarf so you can get a good idea of the design. Finally! After well over a year of being out of stock, we are thrilled and delighted that we again can offer this gorgeous kit. 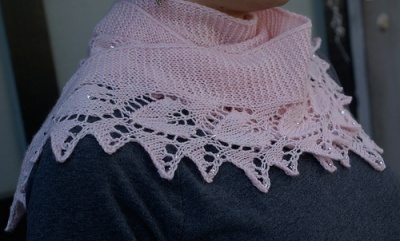 This is Sivia's marvelous Heart to Heart Beaded Scarf, complete with silver lined megatamas and a lovely lace weight yarn. This stunning crescent shaped scarf, fetchingly strung with beaded hearts, is as sweet as pie! 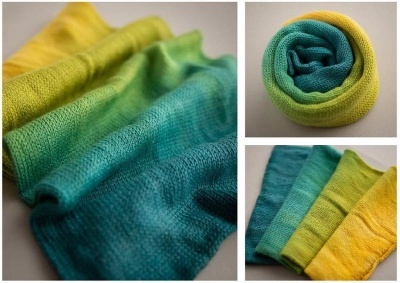 The scarf consists of the heart border, an easy garter stitch body, and a tubular edging, and is worked sideways from one narrow point to the other. 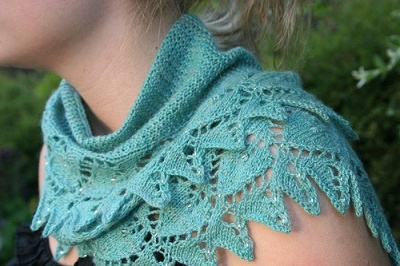 We are not offering the same yarn as what Sivia used to knit her original scarf. You can see what we have in the inset photo on the top photo and again below that. 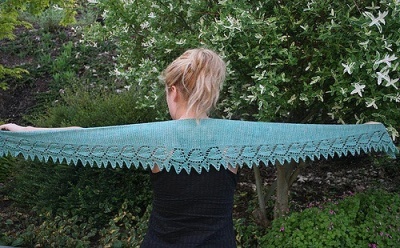 What is needed is about 400 yards (366 m) of a lace weight yarn. 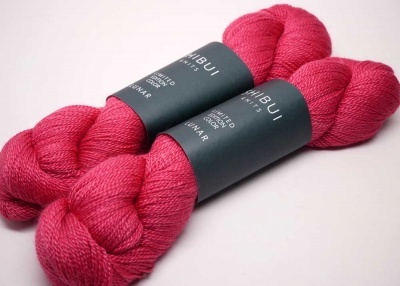 We have a beautiful yarn from Shibui Knits called Lunar, in a special limited edition color. 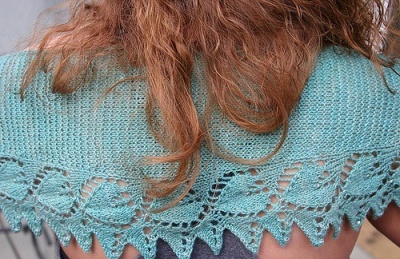 Lunar is 60% extra fine merino/ 40% mulberry silk and it feels truly awesome. Each skein has 401 yards (365m) per 50g. The colorway is called Petal and is a delcious raspberry color. It sings to me of the color of beautiful roses in June. And is also a wonderful song for Valentine's Day. Sivia used 4mm Silver Lined Magatamas, which is exactly what we offer with this kit. She used 174; we will include close to 240 (just in case) of the very high quality Toho beads. Please note that if you would prefer the smaller 8/0 beads, you need only tell me. That would also look very fine, a bit more subtle as it catches the light strikingly. 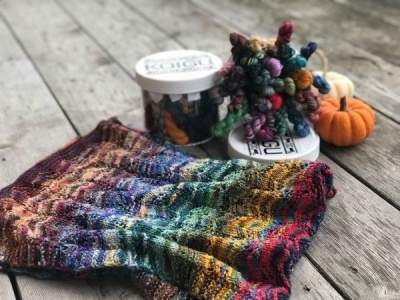 We have found that many knitters prefer to get their patterns via Ravelry, so they are saved in their Rav Library. 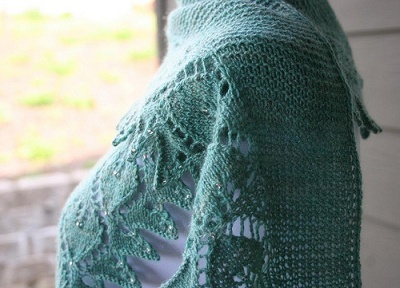 In this case, you should get your pattern directly from Sivia on this page. If you prefer to get your pattern this way, make sure to set the Pattern drop-down menu to "No Pattern Needed." If you would prefer we print out the pattern for you and send on this hard-copy, that is also an option. Or we can directly email you the PDF; just be aware that it is not automatic -- I have to do it manually and generally do that right before shipping your kit.